A jointly written and published study by HYPR Corp and Goode Intelligence on the difference between passwordless user experiences and true passwordless security. Author: Goode Intelligence & HYPR Corp. 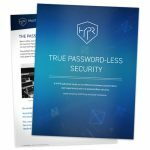 This white paper from Goode Intelligence (GI) and HYPR explores a topic rarely discussed in detail – the difference between passwordless user experiences and true passwordless security. With so many enterprises adopting biometrics and new methods of user authentication, password elimination has been discussed at great lengths by analysts and vendors across the industry. However, many have stopped short of acknowledging an inconvenient truth – that most companies that have adopted biometrics have not actually eliminated their passwords. This white paper defines the criteria for a password-less architecture, identifies the security risks of retaining centralized credential storage and positions decentralized authentication as a convenient solution to delivering true password-less security at scale.